Distribution : South Africa and Réunion Island. 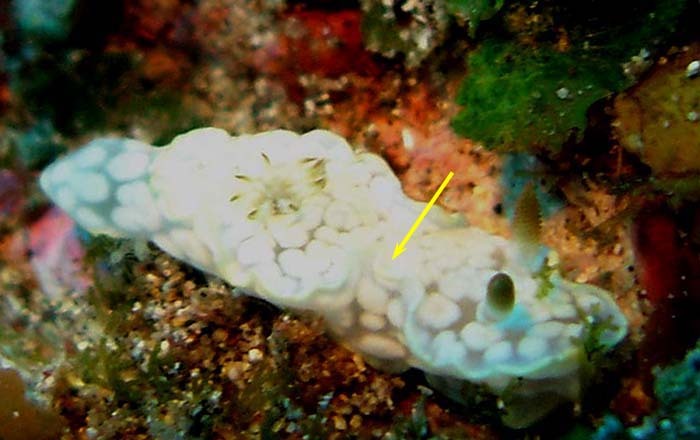 The white spots on the translucent white mantle are crowded and irregular, often elongate, in shape and also occur on the foot. There is a thin yellowish to whitish marginal band. The gills are translucent white with red lining the inner and outer edge of each gill. The foot is like the mantle, scattered with numerous white spots. The foot of the animal is white, somewhat more opaque around the edge of the foot. The foot is translucent white with white patches. 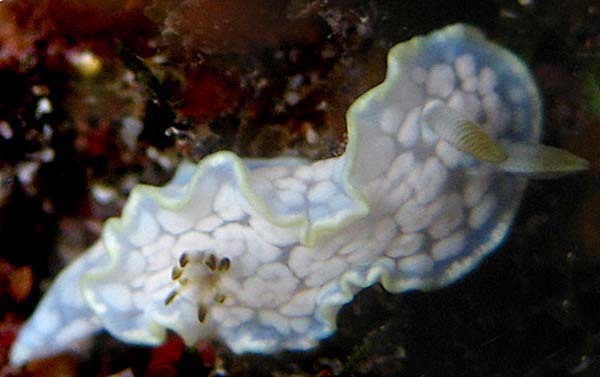 The white Glossodoris is relatively high, the mantle clongately oval with the broad overlap thrown into a series of folds down each side, with a particularly prominent fold on each side halfway down the body. The 8 to 9 gills are simple.